• Why the Soul was created and the “real” reason humans are occupying Earth. • The path the Soul takes in preparing for an earthly life, learning life’s lessons, and what happens upon our return to the other side. • Why suicide is NOT an option. • The symptoms of Ascension. • How to become an Ascended Master in this lifetime or prepare for Ascension in a future lifetime. • What life on Earth will be like in the near and distant futures. Darkness: Where Does It Come From? When I think of the reading I had with Barbara, I am still amazed at how insightful and perceptive she was. Her information was very helpful and I am grateful for the guidance and clarity I received. I met Barbara at the Mid-West Lightworkers Conference and purchased her book, “Creating Heaven on Earth: A Guide to Personal Ascension”. Once I started to read it, I couldn’t put it down and read it more quickly than any other book. It has enlightened me so much! I truly feel blessed for having met her. Her book is amazing and so helpful. It has changed my life. ALL of HUMANITY should read this book. Thank You!!! Barbara, I attended an Angel workshop you lead a couple of months ago and wanted to say THANK YOU for introducing me to Angel Communication and Meditation. I was at a very low place in my life and I kept asking God and Jesus to help me. I was guided to take your workshop and since then my life has been changing in a positive way. I am hopeful again. Just wanted you to know how much I appreciated your time and advice. I had such a great experience in my session with Barbara. I felt that I was brought to a higher level in my development, as a result of the guidance I received from her. I am so grateful for her gift and her willingness to share her knowledge with me. Barbara Hardie literally saved my Daughter’s life! After many years of misdiagnosed illness and over prescribed dangerous medications, my daughter was bedridden and lifeless. Through Barbara’s Heavenly Guidance and extraordinary Divine Gifts, my Daughter is now off all medications and applying for universities this fall. Our Family will remain forever grateful for Barbara’s ability to wield miracles! Wow … I am absolutely amazed. Thank you so much for all of the wonderful and insightful information. You were right on and you also validated what I was thinking and feeling. Thanks again! Barbara Hardie is an extraordinary woman with a special insight in the world of Angels. She has the unique capability to set aside the constant busy thoughts that go on in our heads and create a paradigm shift into the world not traveled by most people – the world of Angels (our protectors and guides). 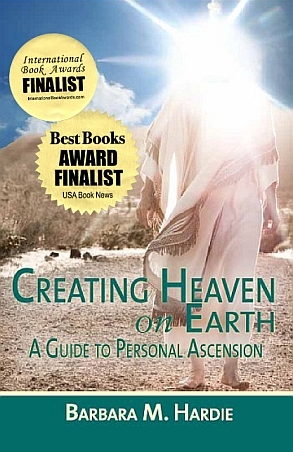 Her book, “Creating Heaven on Earth: A Guide to Personal Ascension” creates new hope and understanding for those who seek help from the spiritual world. Copyright © 2019 Angel Connections. All rights reserved.